#ffconf was absolutely brilliant. Thanks all! As I head home, thank you, again to @rem, @julieanne and the volunteers for @ffconf. Incredible event and I felt incredibly taken care of. Back home & wondering where to start with all the inspiration I got whilst at #ffconf. Thank you @julieanne & @rem for an excellent day. 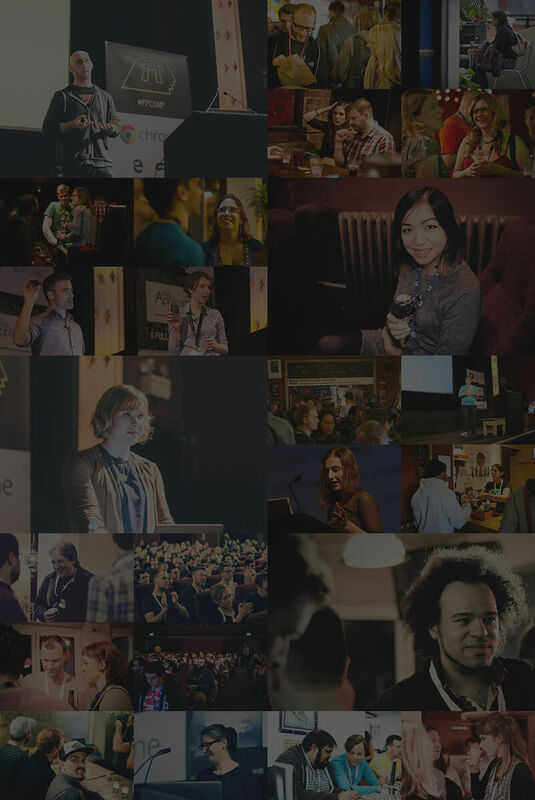 #ffconf is a wrap: what a truly inspirational event with so many interesting topics. Glad that I finally was able to attend. Yes! #ffconf was amazing. Had an inspiring day listening to awesome people, talking about super interesting stuff. Almost too good. I can pinpoint ffconf talks, which have changed the way I approach web development and the tools I use. That's why every year it has an unmovable place in my calendar. I had SUCH a great day being geeky at #ffconf. …Best day! With a little help from Daft Punk, we will explain accessibility mechanics in the browser, why CSS isn't just about looking good, and what tools you can use to get ahead of the game. Continuous Deployment for everybody: from a one-person army to distributed teams. Ecosystem appraisal, time-saving tips, max velocity! Learn about new DevTools features which can greatly enhance your workflow. Also, native Node.js debugging straight from DevTools! "MAKE IT MODULAR," they said. "IT WILL BE BETTER," they said. Modularity is a term so common in today, that it's easy to uncritically accept it as a fundamental development principle. What does "modularity" actually mean? We will talk through the technical etymology of "modularity" and examine history on both its current use today, and where it's heading in the future. What is creative coding, especially with realtime animations and data visualisation. Looking at the animation loop, some gotchas & tricks (e.g. cheap motion blur or glow), sound synthesis, and more. Then we'll do a live coding session to put in this practice, have fun and create something cool together! ffconf takes diversity seriously. We know that a diverse line-up is important for the inclusion of marginalised people in the tech community. We want people to attend because of the content we provide, not who's presenting it. As such, we only reveal our speakers at the day of the conference. This statement is our approach to make our commitment to diversity as transparent as possible. We are striving to do better each year. In 2015, ffconf's speaker distribution included 50% women and this year we intend to maintain diversity in our speakers. And we are proudly holding our event in Brighton. This isn't something we should be proud of, because it should be the norm, but it is what we've got and we'd like to share that with you. You can also apply for our diversity scholarship, open until 9-September 2016. #ffconf is run by Left Logic, a small Brighton (UK) based development company, specialising in Node based applications and bleeding edge front end technology. By attending any of our events (workshops & conference & fringe events) you are agreeing to our code of conduct.